We all agree that conversion optimization has never been easy. You can put great effort into building a website, take consideration in every detail of your work, but the results may be disappointing as most of your traffic keeps bouncing off. Since the bounce rate of a normal website could reach up to 90%, you are likely to lose most of your marketing effort without taking an action! These features allow you to customize your lead-capturing campaigns to be more impressive and audience-oriented. Deliver your messages to the right people, in the right place, and at the right time, soon you will notice a boost in your conversion rates. What you gain is not just the rocketing email list, but also the further site engagement and satisfaction. We do hope that SiteKit will be your ultimate marketing app with every conversion tools you need. Now let’s explore all these features and see how they could help you monetize your traffic. 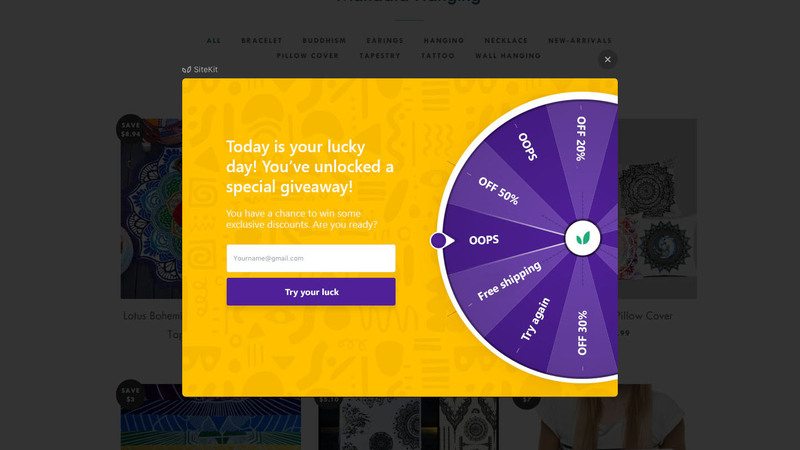 The best time to trigger a popup is right when the visitors are about to leave your site. We call it the exit-intent moment. With this new feature, whenever users hover their mouses near the tab bar, a popup will show up with your inviting offer. And the best part is, it could help you win back 25% of leaving visitors without ever hurting your site UX. You can even set up the popups and smart bars for specific types of visitors. Each visitors have different behaviors and insights. A returning visitor can be 73.72% more engaged to your site than a first-timer. That is why we created two audience segments for SiteKit’s campaigns: new and returning visitors. By setting up different campaigns for separated types of audience, you could create better popups or header bars that reflect their needs. 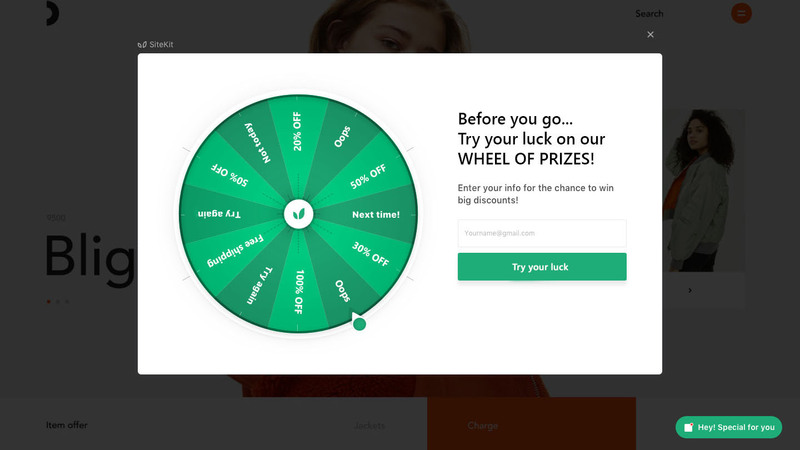 Win Wheel is a coupon popup that let customers play a fun spin-to-win game. You could setup up to 12 slices on the wheels. Each slice contains some kinds of incentives from your site. Especially, the winning ratio of each slice is flexible and customizable, hence you could give out big prizes without risking your revenues much. The gamification tactic could double your email list. What makes it different is that it triggers the fear of missing out from your visitors, which encourages them to take an action. The popups also have a positive impact on your audience’s experiences. Actually, there is nothing quite like winning a contest, or in this case, a Win Wheel game. The email integration has come to SiteKit. You can connect SiteKit with 9 different email service providers including MailChimp, Klaviyo, and GetResponse. This feature helps you import your list in live time, so you to run a powerful automated marketing campaign with all the subscribers collected from SiteKit. Ready to get higher conversion rates? With these premium features, you could get an increasing email list with lots of qualified leads or customers. You can still use our free plan forever. However, if you really do want to level up your site with more engagement and professionalism, upgrading SiteKit is a good deal. In case you are unsatisfied with the app, we do give you a full refund within 15 days with no questions asked! That is a risk guarantee here, so why don’t you start boosting your conversion rates with SiteKit premium now? Do you have anything to share? Comment below what you think of SiteKit’s premium version. Any ideas on the app’s features are also appreciated!